Left Rio on a mammoth bus journey - it took 25 hours! There was recliner seats though and I was wrecked from partying the previous night - thanks Wacky! so I slept for most of it. Was the only Gringo on the bus though so had no clue of what was happening anytime we stopped. Only got off the bus at one place where I wolfed down food and had a smoke, terrified that the bus would leave without me!! Reached Foz de IguaÇu at the bottom of Brazil and decided to be adventurous and get the buses across the border rather than paying the extra for a taxi. Three hours later but having saved maybe 15-20 euro, I reached the hostel in Puerto Iguazu. Well worth the effort! There were five Irish in my room so started chatting to them. Then there was a BBq in the hostel where I met other Irish, a Dutch girl and Israeli guys. Ended up having a good night but stayed up far too late seeing as how my trip to the falls was starting at eight the next morning. Wow, the falls are awesome - in the proper sense of the word, not the American sense. Seriously, the power of nature is amazing...you would almost become a pagan looking at the falls. Started out by going on a boat trip up the river. The boat goes under the spray of the falls and it is like a realy strong shower - you can´t open your eyes with the force of the splashes. We watched a later boat and they didn´t really go under the cascade at all, only under the sprayback but when you are in the boat you feel like you are directly under the cascade. Then there are 3 walks - one brings you along the bottom of some of the falls, the next brings you along the top of those falls and the third is by far the best. You get this little train, think of the one that brings you round Dublin Zoo, up to this landing area and walk for at least a mile across these gangways that are over rivers that are wide enough to seem like lakes. Then finally in the distance you can hear a thundering noise and can see spray over the trees. I have never seen anything like it - It´s called the devil´s throat and for good reason...nothing that goes over these falls could possibly survive (even you Sean). The photos dont really do it justice. Uploaded a video of it to youtube - http://ie.youtube.com/watch?v=nG3C_QqJL_I which is slightly better at portrating it. It´s hard to describe though...the water was falling with such power that you couldn´t see the bottom of the falls and the glare off the spray meant you needed sunglasses to look at it. Went over to the Brazilian side the two days later where you get more panoramic views but I definitely preferred the up close experience in Argentina. 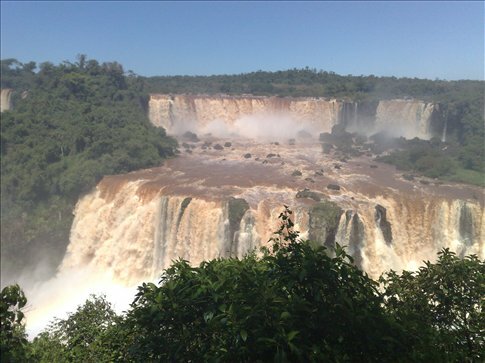 Poor Paraguay...the falls are just about where the three countries meet but can only be seen from Argentina and Brazil. All Paraguay gets is the dam upstream which although it influences the flow is not a tourist attraction at all. Definitely worth going to see if you are anyway near here...in this continent that means up to about 36 hours on a bus away. There is a campaign on the net to find the new 7 wonders of the world - here should definitely be on it!